Looks like sabotage, does it not? I have a drill bit that would make that diameter hole. But who would want to drill fuel hose on a dink? The answer according to three independent sources? Worms. Yup, occasionally Avalon is home to some mysterious worms that chew up fuel hoses and then die in there. Well that would be verifiable, wouldn’t it? 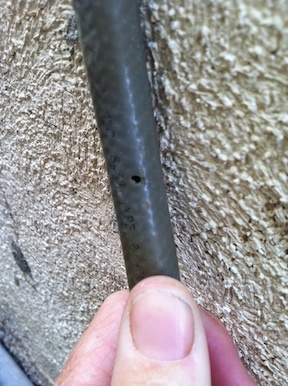 So I cut open the holey hose and found … nothing. The observation by one “know everything” was that those holes were too big for the worm problem. Three other males who I will not name, suggested that perhaps the worms were pregnant. And that’s as far as it went. I googled fuel eating worms and got zippo. I replaced the hose and carried on with my day. In other news, I cut most of the tip off the thumb showing in the picture up there today. It aches a little now. I’ve bandaged the bejabbers out of it. I have a feeling it’s going to pulse tonight while I am trying to sleep. Sleep might be interrupted for other reasons. It’s gusting up to 30 mph out there. But the office isn’t that quiet either. Is there some basketball playoffs thing going on? That crowd roar always gives me the image of the collosseum and throwing Christians to the lions. I’ve been up since before dawn so maybe I won’t notice the wind blowing me sideways. This entry was posted on Wednesday, May 21st, 2014 at 12:54 am and is filed under Uncategorized. Tagged: Avalon, fuel hose, fuel hose eating worms, worms. You can feed this entry. You can leave a response, or trackback from your own site.